2015 Inky Awards Longlist announced! 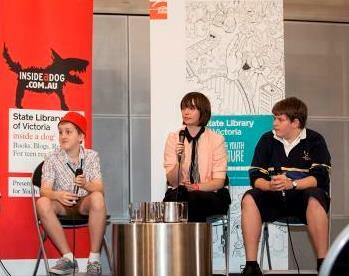 The INKY awards is an annual event hosted by the Centre for Youth Literature at the State Library of Victoria. The Inkys are the only Australian awards for Young Adults which are voted on by Young Adults. The 2015 Inky Awards longlist was announcement just last week and includes some awesome titles! The Inky Awards recognise high-quality young adult literature, with the longlist and shortlist selected by young adults, and the winners voted for online by the teen readers of InsideaDog. There are two awards: the Gold Inky Award for an Australian book, and the Silver Inky Award for an international book. Read more about the books longlisted on the Inside a Dog website and encourage young adults across Australia to put their hat in the ring to be one of the judges. Read what is involved at: Want to be an Inky Awards Judge? 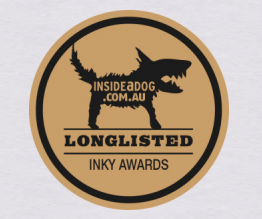 Inky Awards: Vote Now | Inside A Dog. The Inkys voting is on again! You can find a list of the Shortlisted Gold (Australian) Inky and Shortlisted Silver (International) Inky books by going to the catalogue and looking for the Resource Lists. Do you know any #YALit fans aged 12–20 with a love of words, a distinguishing eye and aspirations for literary criticism? We are in search of keen teenaged readers to become the 2014 Inky Awards judges. A panel of six judges will be selected to read the twenty longlisted Inky Awards titles and whittle them down to a shortlist of ten. Applications close Monday 14 April. MORE INFO HERE. Three of last year’s judges (L-R) Harison, Sarah and Chris are pictured here at the 2013 Inky Awards. I don’t often post as ‘me’, but I highly recommend applying for this position. You get to keep the books, and the Inky Awards and the judges are held in high regard. Go for it! The Inkys are a highlight on the YA reader’s calendar, and the longlist announcement is always hotly anticipated. There are two Inky awards up for grabs: The Gold Inky, which is awarded to an Australian book and author, and the Silver Inky, which is awarded to an international book and author. You can see the complete list on the Inside a Dog Website. Inky Awards – this one’s for you! Every year the Centre for Youth Literature at the State Library of Victoria runs the Inky Awards. The Inkys are the only awards for Young Adults that are voted on by Young Adults. These awards are for you! You can VOTE for your favourite book on their website. You can enter their Audience Prize – make a cake, create a trailer, hold an Inkys party, let your imagination run wild. More information here. At the Reading Matters Conference 2013, the Inkys Longlist was announced. You can see the full list on the webpage, and here is a list of the titles held in the GFL for your reading pleasure. Wildlife by Fiona Wood – GFL – in processing: 5 June. This is Not a Test by Courtney Summers – coming soon! See You at Harry’s by Jo Knowles – coming soon! Hostage Three by Nick Lake – coming soon! The Originals by Cat Patrick – coming soon! The Raven Boys by Maggie Stiefvater – FAL – coming soon to GFL! Drama by Raina Telgemeier – coming soon! Code Name Verity by Elizabeth Wein – coming soon! The Fifth Wave by Rick Yancey – GFL – in processing: 5 June. You can access the 2013 Gold Inky Longlist on Destiny HERE and Destiny Quest HERE. You can access the 2013 Silver Inky Longlist on Destiny HERE and Destiny Quest HERE. The Inkys Longlist for the Gold (Australian) and Silver (International) Inkys have been announced on the SLV ReadAlert Blog. You can see the blogpost HERE. And check out this list to see which ones we have in the GFL. Some totally wicked titles here! Get stuck into them! Another Inky Judge from Mentone Grammar!! That was the reaction of Library Staff in the Gregory Fish Library when they found out this week that Year 9 student Joe Bosa had been successful in his application to be a judge for the 2012 Inky Awards, the only teenage literature awards in Australia which are voted upon by teenagers themselves. Joe, a committed reader and avid member of the MGS Book Club since it was begun in 2010, is over the moon at having been selected! Regularly hovering around the library and always keen to have a chat about the latest good reads, Joe is a credit to both himself and Mentone Grammar! This is the second year in a row that Mentone Grammar has had one of its students selected for the coveted role of Inky Awards Judge – a very impressive achievement! 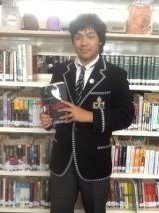 The increasingly strong interest by Mentone Grammar students in reading and literature is indeed commendable. Read an interview with Joe – HERE. Kevin Lee was one of two adult judges on the Inky Judges panel. He has some really interesting insights into the process. You can read about them here. Wow! Such a strong field. Also, keep your eyes on the Inside A Dog website for details of a Readers Competition for the Inkys. Teen Video Book Awards book.